Eschew the tourist crowds and head to Bellevue Beach and Linden Esplanade. You'll get in some beach time at Beach Mansikkalahti and Aurinkolahti Beach. 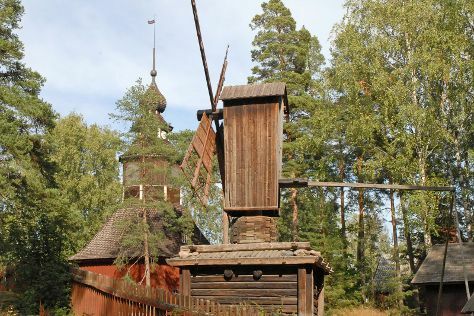 You'll find plenty of places to visit near Helsinki: Riihimaki (Suomen Lasimuseo (The Finnish Glass Museum) & Riihimaki Art Museum), Parola Tank Museum (in Parola) and Kotka (St. Nicholas Orthodox Church & Langinkoski Imperial Fishing Lodge Museum). And it doesn't end there: browse the exhibits of Seurasaari Island and Open-Air Museum, take an in-depth tour of Ekenas Museum, examine the collection at Motorcycle Museum of Finland, and wander the streets of Katajanokka. To see photos, more things to do, other places to visit, and other tourist information, read our Helsinki trip planner . If you are flying in from Canada, the closest major airport is Helsinki Vantaa Airport. In May, daily temperatures in Helsinki can reach 18°C, while at night they dip to 7°C. Cap off your sightseeing on the 8th (Wed) early enough to travel back home.